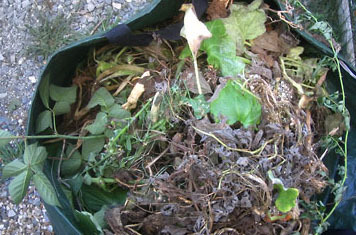 Composting is a simple process of layering your materials with a bit of soil in a pile and turning them once in awhile. The more sophisticated you are with combining materials, checking moisture and turning, the faster your pile will "cook" down to a useable humus. Compost loosens the soil to allow better root penetration, improves the soil's capacity to hold water and nutrients, adds essential nutrients to the soil, and improves the health of plants. Composting is a practical and convenient way to handle your yard waste. It can be easier and cheaper than bagging these wastes or taking them to a composting facility. Compost also improves your soil and the plants growing in it. Compost can be used to enrich the flower and vegetable garden, to improve soil around trees and shrubs, as a soil amendment for houseplant and planter boxes. Learning the basics: "Green" and "Brown"
Greens provide nitrogen, and act as a source of protein for the microbes that are hard at work in your compost pile. Browns are a source of carbon, and provide energy for the microbes. While many materials can be composted, there are some items that you should keep out of your home compost pile. Excluding foods with meat, dairy or oils will minimize odors and keep your pile from attracting scavengers like dogs and raccoons. Since compost is generally used for a soil amendment, you want to keep if free of plant diseases and unhealthy bacteria. The Clark County Waste Management District has a limited supply of Earth Machine compost bins (with instructions) for sale! The cost is $40 and they can be purchased at the Recycling Center, 1602 W Main Street, Springfield, every Thursday from 9 a.m. to 6 p.m. or the first Saturday of each month from 9am-12 noon. These containers for yard wastes are the least labor and time consuming way to compost. Non-woody yard wastes are the most appropriate. Place the holding unit where it is most convenient. As weeds, grass clippings, leaves and harvest remains from garden plants are collected, they can be dropped into the unit. Chopping or shredding waste, alternating high carbon and high nitrogen materials, and keeping up good moisture and aeration will all speed the process. For yard wastes, this is the simplest method. The units can be portable, moving to wherever needed in the garden. This method can take 6 months to 2 years to compost organic materials, so you only need to be patient. This is a series of three or more bins that allows wastes to be turned on a regular schedule. Turning units are most appropriate for gardeners with a large volume of yard waste and the desire to make a high-quality compost. Non-woody yard waste and kitchen wastes without meat, bones or fatty food. Alternate the layering of high-carbon and high-nitrogen materials to approximately a 30:1 ratio. These should be moistened to the damp sponge stage. The pile temperature should be checked regularly; when the heat decreases substantially, turn the pile into the next bin. Dampen materials if they are not moist, and add more high-nitrogen material if heating is not occurring. Then make a new pile in the original bin. Repeat the process every time the first bin cools. After two weeks in the third bin, the compost should be ready for garden use. Yard wastes can be used for weed control and water retention. Woody yard wastes, leaves and grass clippings. 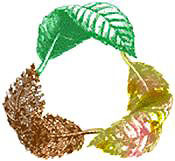 You can simply spread leaves or grass clippings beneath plantings. For woody materials up to 1" in diameter, rent or purchase a chipper/shredder. All yard wastes will work first as a mulch and then, as decomposition proceeds, as a soil enrichment. A disadvantage of mulching with woody yard wastes is that you may have to rent or buy equipment. Burying your organic wastes is the simplest method of composting. Kitchen scraps without meat, bones or fatty foods. Everything should be buried 8 inches below the surface. Holes can be filled and covered, becoming usable garden space the following season. This is a simple method, but because of the absence of air some nutrients will be lost. Rodents and dogs can become a problem with wastes buried less than 8 inches deep. Feeding worms in wooden bins is a good way to make high quality compost from food scraps. Kitchen scraps without meat, bones or fatty foods. 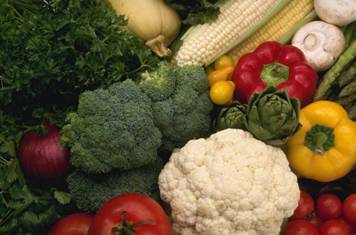 Onions and citrus are not good for worms. Fill a bin with moistened bedding such as peat moss for the worms. Rotate the burying of food wastes throughout the worm bin. Every 3-6 months the worm populations should be divided and moved to fresh bedding. Vermicomposting is a good choice for people without yard space, such as apartment residents, and produces a high-quality plant food. Successful vermicomposting usually needs more careful monitoring, as the worms will die at temperatures lower than 50 degrees or higher than 90. If too much food is added, the mixture will start to compost and can heat up past the point the worms can tolerate.